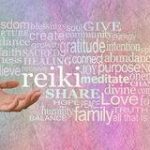 “Experiencing the wonderful world of Reiki with Gill has been, and continues to be a life changing journey. I have referred family members and friends to receive Reiki with Gill and they too have found her healings input to be a great support. She teaches Reiki and offers guidance in a grounded way. This allowed me to fully understand the great gifts Reiki has to offer and how these gifts could have a positive impact in my daily life.